On 10th June 1215, King John of England and his entourage rode out from his castle in Odiham, Hampshire, to meet a group of rebel barons in the water meadows at Runnymede, near Windsor. On 15th June, they sealed ‘Magna Carta’. Well, actually, they sealed the ‘Charter of Runnymede’, a forerunner of what later became known as Magna Carta in 1217. But let’s not allow factual accuracy to get in the way of the celebrations 800 years on. 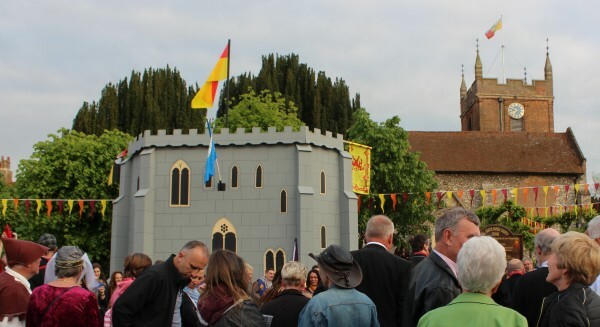 In Odiham, we’ve been celebrating in medieval style. 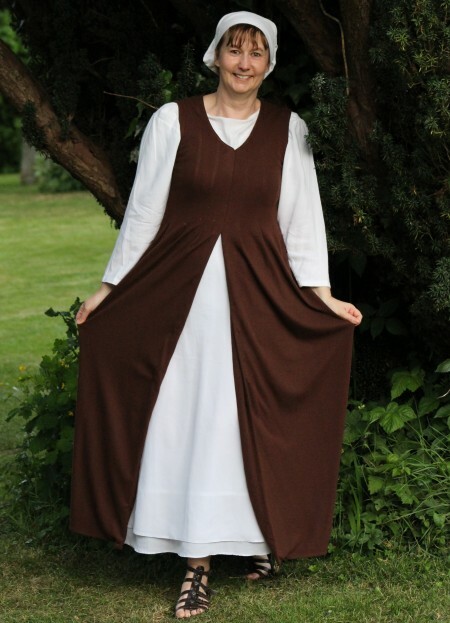 Odiham peasant – I’ve no illusions of grandeur! 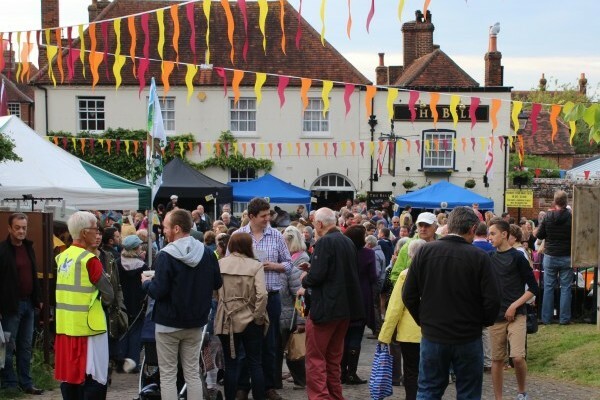 First, we all put our flags and bunting out, so that anyone approaching Odiham and the neighbouring village of North Warnborough would know there was something going on. 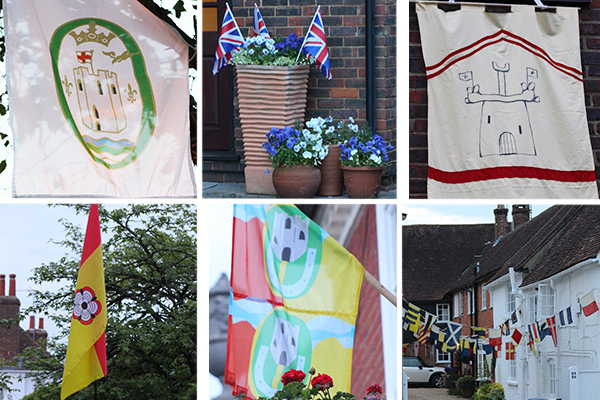 The colourful flags of all designs and sizes fluttering outside our shops and homes gave a heart-warming sense of community and proved to be surprisingly educational, as prior to this event I had no idea what the Hampshire county flag or the Odiham parish flag looked like. The new Mayhill flag was designed by children at Odiham’s Mayhill Junior School to represent the NE Hampshire constituency in a parliamentary flag competition. The green ‘O’ represents ‘Odiham’ and the close relationship the village has with the natural environment. 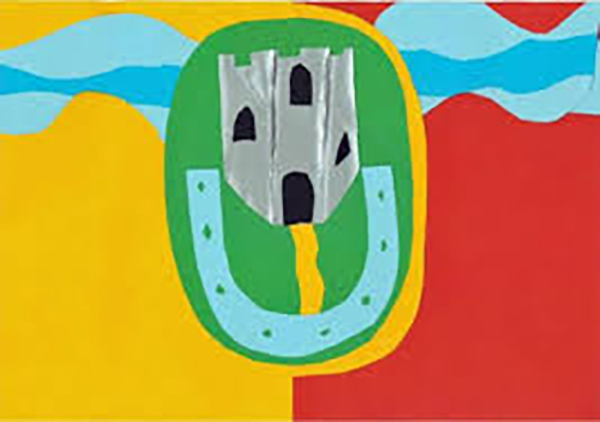 Inside the ‘O’ sits Odiham castle above a horse shoe, depicting Odiham’s connections with farming and King John’s journey to Runnymede (and let’s not forget the village’s association with the start of the veterinary profession in England). The two strips of blue across the top of the flag represent the River Whitewater and the Basingstoke canal. 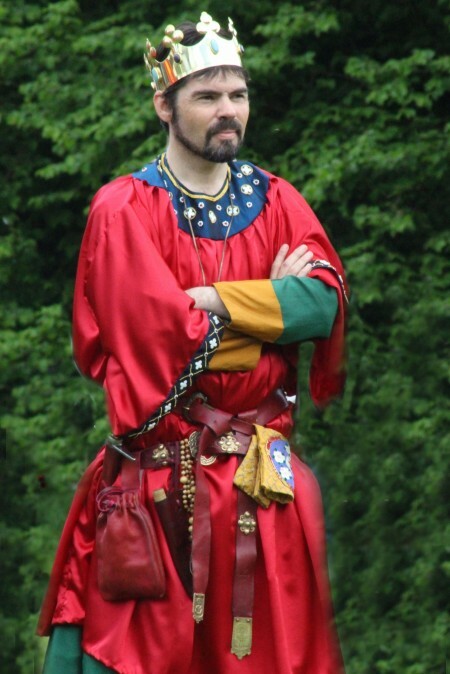 The gold and red backgrounds reflect Odiham’s historic connection with royalty. 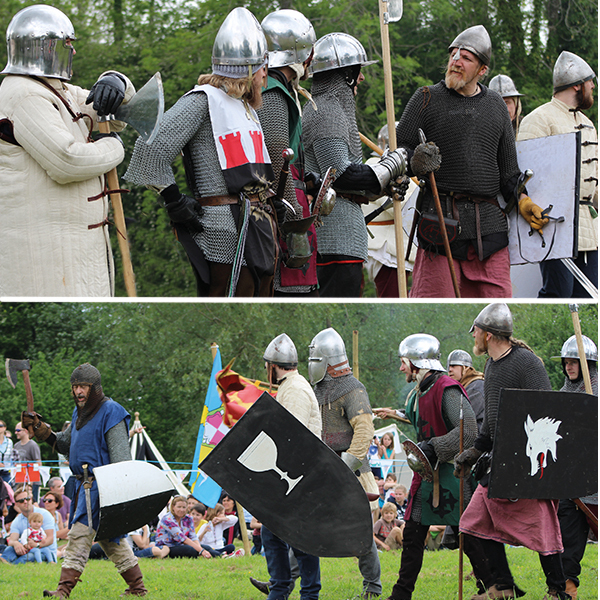 The actual festivities got under way with a procession through the village, led by King John and some of his courtiers on horseback. 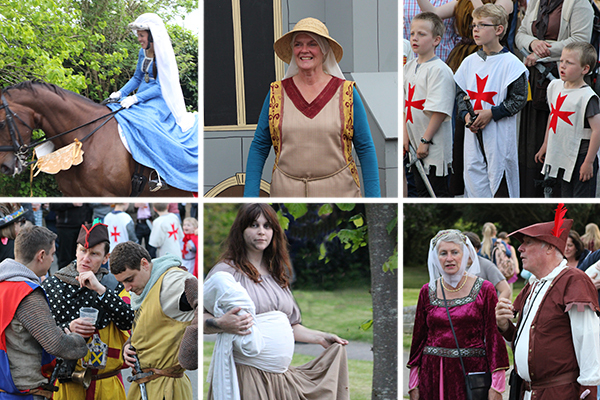 There was a huge turnout, with lots of people getting into the spirit of the event in medieval costume. After the procession we congregated in ‘The Bury’, the former market square at the heart of the village in between All Saints church and The Bell pub. 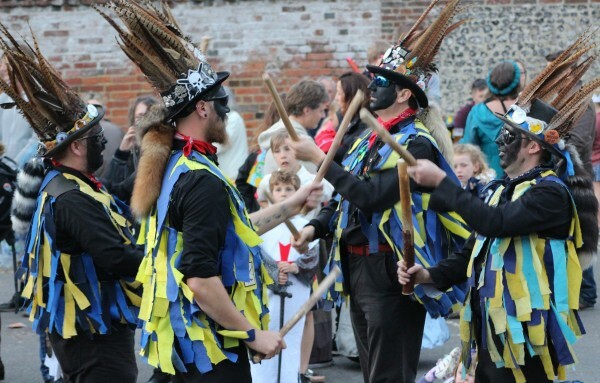 The Hook Eagle Morris Men got the party started, with a lot of yelling, a fair bit of stomping and plenty of bashing of stout sticks; there’s nothing dainty about their form of Border Morris dancing – in fact, it’s pretty primeval. And a lot of fun! 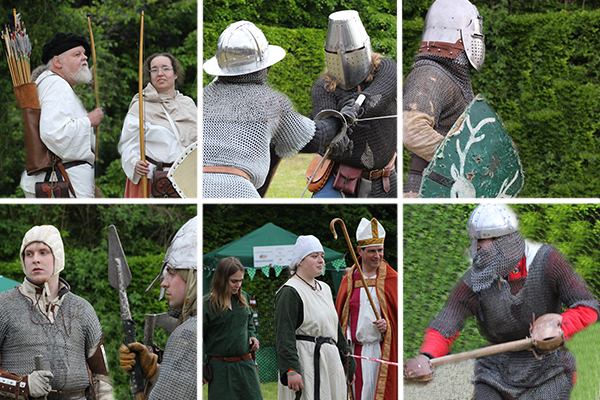 Meanwhile, in the walled garden adjacent to The Bury, medieval re-enactors battled each other with swords and spears. 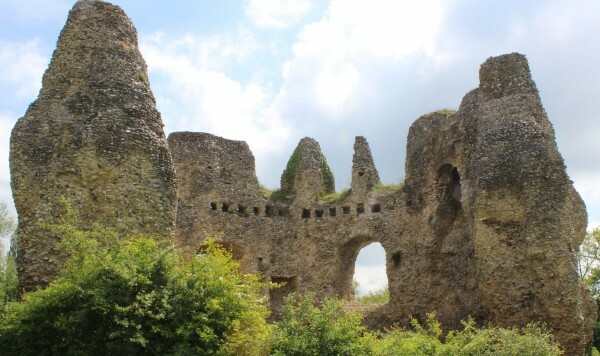 If that wasn’t enough excitement for this normally quiet corner of North East Hampshire, for several days the 13th century also returned to the fields surrounding the remains of Odiham castle (also known as King John’s castle) on the Basingstoke canal. 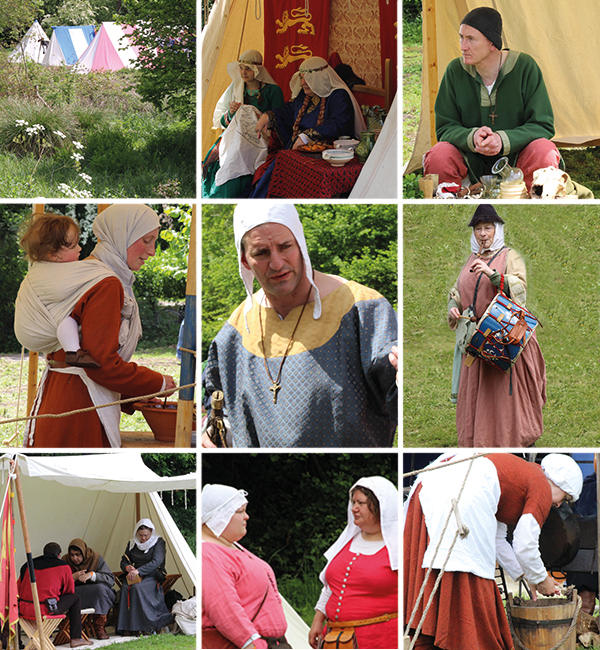 Here, the Feudals Living History Group, along with several other historical re-enactment groups, camped out to demonstrate the various crafts and skills that would have been used during this period. 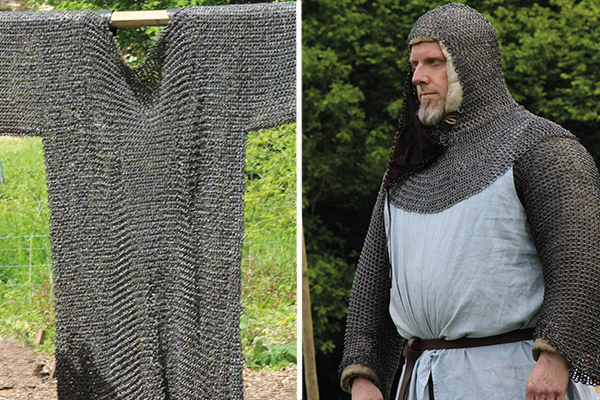 I was particularly amazed at the weight of chain mail. It was a wonder the knights of the day could walk in it, let alone fight. The falconry display by Albion Historical Falconry was a real treat. They train all of their birds of prey using historically accurate methods, derived from manuscripts dating from the 1100s to the 1800s. 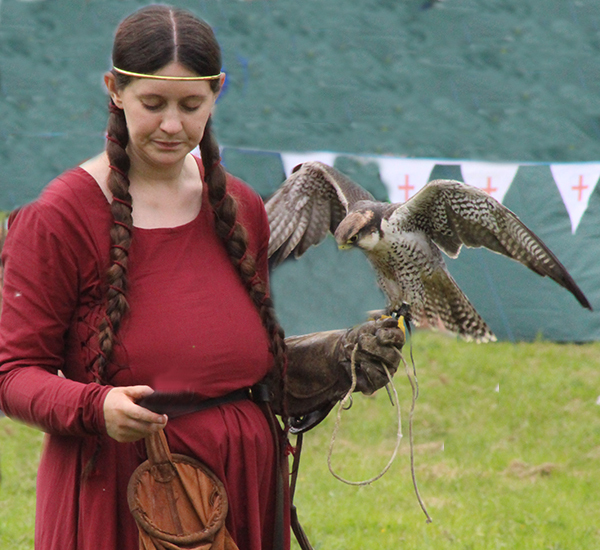 Although King John is believed to have favoured the Peregrine falcon and Goshawk (native British birds), he would have been familiar with the use of Saker and Lanner falcons too. The terrain wasn’t suitable for the Peregrine falcon to be flown (given the speed at which it flies there wasn’t enough room for it to land! ), so it was the Saker falcon that stole the limelight on this occasion, soaring at speed around the trees, which it used as cover to avoid prematurely alarming its prey, before swooping in on the lure at incredible speeds. And of course, there was always time for one more battle. Even King John made an appearance. On the one side, the rebel barons; on the other, King John’s knights. On this occasion, it didn’t end well for either side! 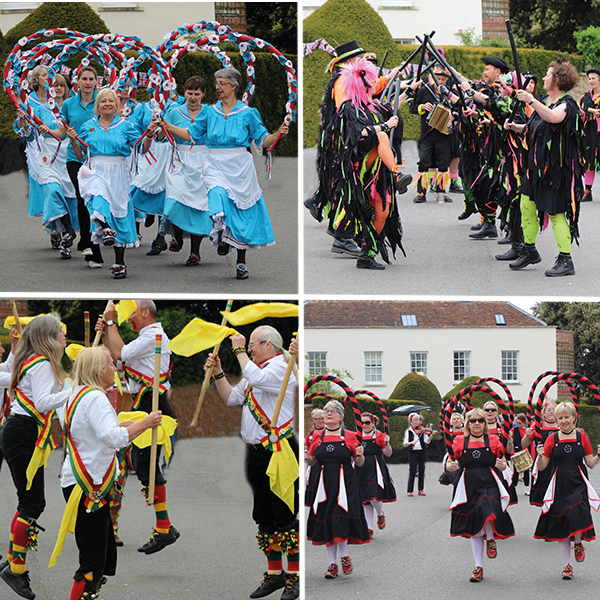 As if that wasn’t enough, there was also a village flower festival in All Saints church, with over 30 stunning displays from various local clubs and community groups, and a clog and morris festival involving 20 Morris teams from around Hampshire. 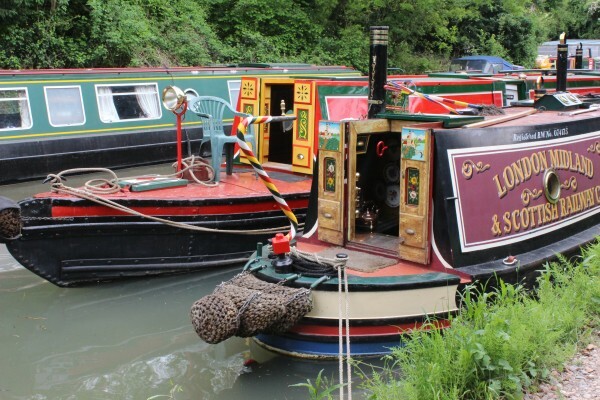 Meanwhile, down at Odiham wharf, a canal boat rally was in full swing alongside canoe demonstrations and music by the Cactus Brass Band; it all added more than a little touch of colour to the Basingstoke canal. BUT, the piece de resistance of all the amazing organization for these celebrations has to be the phenomenal embroidery depicting 800 years of Odiham’s history from the time of ‘Magna Carta’ (King John is depicted setting off for Runnymede) to the present day (as depicted by a Chinook helicopter from RAF Odiham). 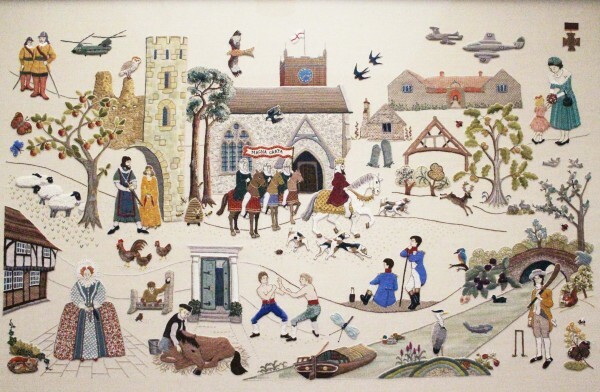 Designed by Odiham-based artist Mary Turner, with contributions from around 70 volunteer stitchers, this beautiful work of art hangs in Odiham library, so if you’re in the area, take a look!! Magna Carta (‘The Great Charter’) laid down the principle that everybody, including the king, was subject to the law. In particular, the 39th clause gave all ‘free men’ the right to justice and a fair trial. Although the initial document failed to achieve much in 1215 (within a few weeks of making the agreement, King John, nice guy that he was, had the pope annul it! ), it was, effectively, the first written constitution in European history and became part of English political life. It is now enormously symbolic as the foundation of democracy and civil liberties in England and as a major influence on the law of the land in the USA.